Archbald, PA. SIMONA AMERICA and Boltaron recently welcomed two new associates to the marketing communications team based in Archbald, PA, led by Adam Mellen, CSO, VP of Sales and Marketing and Molly Bridger, Marketing Communications Manager. “We are very excited to have more talent and creativity on the marketing team and look forward to gaining a competitive edge in the industry with better storytelling, market positioning, and fresh sales collateral dedicated to servicing our customers,” said Mellen. Ann Dutton joins the company as the Digital and Graphic Design Specialist. Ann most recently worked at the Himalayan Institute in Honesdale, PA, where she was the lead designer. With multiple award winning design projects under her belt and a keen understanding of user experience pertaining to web design and print copy, she will be a great asset to the SIMONA team. 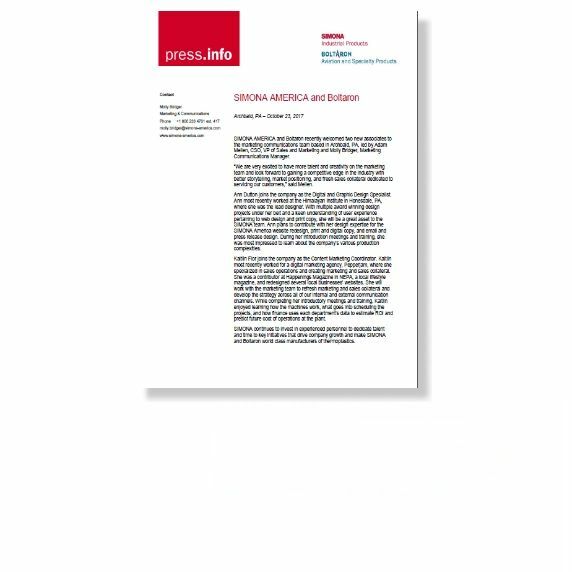 Ann plans to contribute with her design expertise for the SIMONA America website redesign, print and digital copy, and email and press release design. During her introduction meetings and training, she was most impressed to learn about the company’s various production complexities. Kaitlin Flor joins the company as the Content Marketing Coordinator. Kaitlin most recently worked for a digital marketing agency, Pepperjam, where she specialized in sales operations and creating marketing and sales collateral. She was a contributor at Happenings Magazine in NEPA, a local lifestyle magazine, and redesigned several local businesses’ websites. She will work with the marketing team to refresh marketing and sales collateral and develop the strategy across all of our internal and external communication channels. While completing her introductory meetings and training, Kaitlin enjoyed learning how the machines work, what goes into scheduling the projects, and how finance uses each department’s data to estimate ROI and predict future cost of operations at the plant. 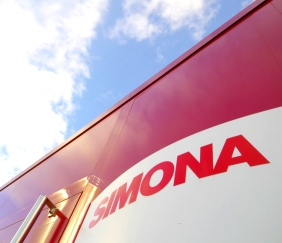 SIMONA continues to invest in experienced personnel to dedicate talent and time to key initiatives that drive company growth and make SIMONA and Boltaron world class manufacturers of thermoplastics.